The Coffee County CHS tennis team welcomed Tullahoma to the Raiders’ home court on Friday. The Red Raiders rolled to a 6 to 1 win to get the season sweep over the Wildcats. The Lady Raiders fell in a 4 to 3 decision to settle for a season split with the Lady Cats. 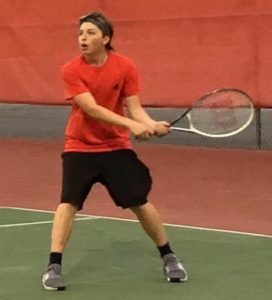 In the boys’ match, the Red Raiders swept the doubles matches and won 4 of the 5 singles matches. Benedict Edinger and Jaden Talley won their doubles match 8 to 5. Jonah Rollman and Johnathan Welch won 8 to 1. In singles play, Edinger(8 to 5), Talley(9 to 8), Welch(8 to 6) and Landon Booth(8 to 1) got the Raiders 4 singles wins. In the girls’ matches, the Lady Raiders got singles wins from Wren Lawson(8 to 3) and Emma Fulks(8 to 0). Fulks teamed up with Lauren Perry to win 8 to 2 in doubles play. The CHS tennis team will be back at home on Monday when they play host to Lincoln County. The first matches will get underway at 4 PM.